Ha! Ha! Hee! Hee! Elmo's hysterical laugh is back! The magic of Tickle Me Elmo returns redesigned for a whole new generation of fans! Little ones can start the hilarious fun when they press his tummy or squeeze his feet. First they'll hear Elmo's contagious giggle. 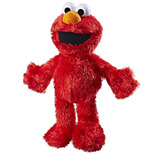 When they continue to squeeze and "tickle" Elmo, he laughs harder and harder until he starts to move and shake! Children can't help but giggle along when they hear his funny sayings and hysterical laughing sounds. Tickle Me Elmo is as silly, cuddly and lovable as ever! He's funny! He's furry! You can't put this giggle monster down! 2 AA demo batteries included. He's baaaaaack! 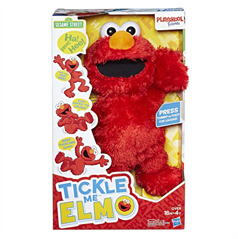 And sure to make a toddler niece or nephew giggle and laugh just like he did back in the 90s when Tickle Me Elmo was first introduced.